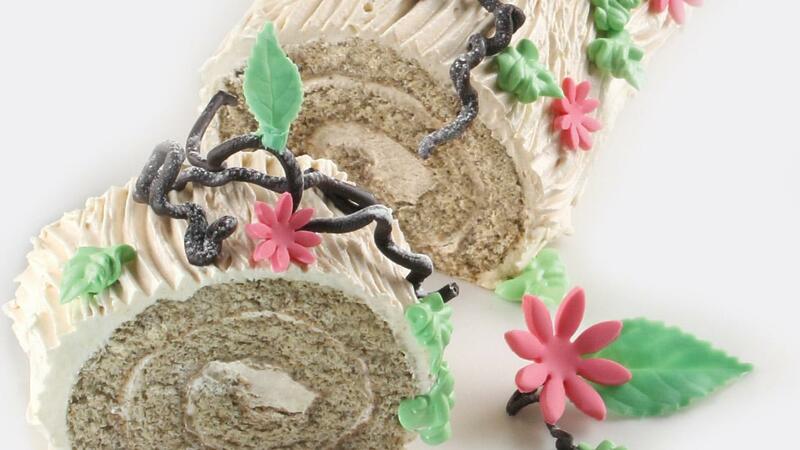 This Swiss roll is made with a fluffy chiffon cake and is not so sweet. Your customers will be addicted to it. Whisk egg yolk and caster sugar until it's getting white and expand in a mixing bowl. Whisk egg white and caster sugar until it's in a medium peak and add it into first mixture. Sieve the flour and Maizena. Then, add Lipton Earl Grey Stl (has been crushed by blender) on the flour and mix them well. Add it into the whisking egg dough and mix them well. Put the dough into a 40x60 cm baking pan that has been based at the lower side by a baking paper. Bake the dough at 180⁰ C for 10-12 minutes. Leave it until it's getting cooler. Melt the cater sugar in a pan until it's turning into dry caramel. Add the glucose and non dairy cream into the caramel carefully and keep stirring it using a wire whisk. Turn off the fire and add margarine. Let the margarine melt. On another bowl, mix white shortening, the soft cream, and icing sugar (if you like a sweeter taste) and whisk them until expand. After that, add the caramel into the butter cream and whisk them until they are getting stiff. Smear 400 g caramel butter cream on the top of Swiss Roll Sponge (40x60 cm) and roll it.